The local aerobics run by Copper have started! I hope that you're all getting in shape! The aerobics are every day from July 25 to August 31 at 6.00 to 7.00 am. (You might want to note that if you start up your AC game disc at 6:55AM or afterwords, no one will be at the wishing well and you will not be able to get your card stamped. In addition, there will be no aerobics on days with inclement weather, like rain) I hope you all have fun! If you ever would like to practice aerobics at your own home, just talk to Tortimer each day at the Wishing Well, during the aerobics. He'll give you a card which will be stamped each day that you come for aerobics. Once you have come 14 times, he will give you an aerobics radio! (It cannot be playing at the same time as another radio in the room. When you turn one on, the other turns off) It may also be possible to get two Aerobics Radios as Tortimer will give you another card to stamp even after you've gotten the first radio. As far as the stamp card goes, you can discard it as many times as you want without any detrimental effect. 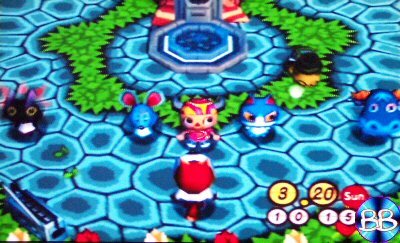 Here is a link to all Animal Crossing music. Just click the Choisissez une musique, and scroll down to Fête du Sport - (Aérobic)! Have fun listening!